Natural Remedies For Tinnitus - Stop The Ringing In The Ear! Do you consistently get ringing in your ears? This annoying and irritating condition has a fancy medical name called tinnitus. The good news is that ringing in your ears doesn’t necessarily mean you have an underlying disease. Mostly everyone might experience tinnitus at one point in their life, especially after being around loud noises such as a concert. This transient tinnitus ringing is usually short-lived. A more serious problem is when someone develops chronic tinnitus, which means symptoms will last more than six months. Nearly 50-60 million people in the United States suffer from this condition that can be associated with hearing loss. Although many people think tinnitus is a sign they are going to become deaf or have a major medical issue, it rarely happens. Tinnitus can come and go, but you don’t have to let that ringing noise in your ear keep you up at night or interfere with daily activities. Objective Tinnitus: This is when your doctor can hear when he performs an exam. Although rare, this form of tinnitus is due to a blood vessel issue, muscle contractors, or middle ear bone condition. Subjective Tinnitus: Only you can hear this type of tinnitus, and it’s the most common. The culprit of this type could be due to issues with your inner, middle, or outer ear. Some reasons you may experience this nuisance is because of exposure to loud noises, overbuild of earwax, head injury, whiplash, or possibly a side effect to a certain medication you are taking. Repetitive exposure to loud noises can damage the tiny, fine hairs that line your inner ear. Constant vibration in response to sound waves can result in tinnitus. Individuals who listen to loud music regularly on headphones are prone to this condition or an ear infection. Prolonged anxiety and stress may cause hormonal changes and depleting nutrients in your body. This may increase the chances of developing tinnitus. Nutrient deficiency is one of the most common causes of tinnitus. Fortunately, there are natural remedies that can help you get rid of that “ringing” in your ear. 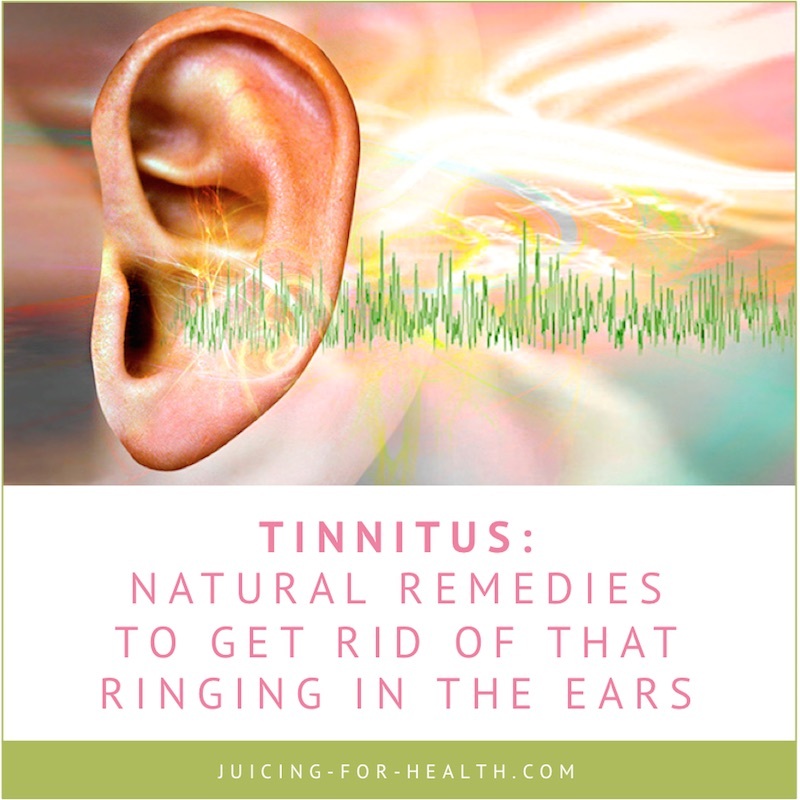 You don’t have to constantly rub your ear to try and get the ringing noise to stop—several natural remedies can help you overcome tinnitus. These are especially helpful if the ringing started due to deficiency of certain nutrients. Magnesium is high on the list of the first supplement to try when you have tinnitus. It is well-known to protect the nerves in the inner ear. This supplement is a glutamate inhibitor. Glutamate is a neurotransmitter that is produced by the sound waves of the hair cells in the inner ear. Studies have demonstrated an improvement in hearing when participants, who suffer from noise-induced hearing loss are supplemented with magnesium. The result has been promising as magnesium helps maintain normal nerve function, including the nerves that are involved in hearing. Adding this supplement or foods rich in magnesium to your diet can help tinnitus. It’s worth checking to see if you have a zinc deficiency. If you supplement with 20-30 mg of zinc each day, you can relieve or even rid tinnitus. It’s best to use this supplement for at least 3-6 months for best results, especially if you are deficient. Several studies reveal that zinc is useful with tinnitus and hearing loss that is age-related. Fun Tip: Put a zinc lozenge in your mouth and taste it. If you think it tastes gross, you aren’t deficient in zinc, but if it doesn’t have much taste, you are deficient. Nearly everyone who experience tinnitus are deficient in B12. Patients who were given a methylcobalamin form of B12 were able to resolve the ringing in their ears. Consider taking 50 mg of vitamin B12, 2-3 times each day to stabilize the fluid in your inner ears. You can find B12 in many whole grain products, eggs, milk, cheese, meat, fish, shellfish, or take it in supplement form. Being deficient in Vitamin A could lead to inner-ear issues such as tinnitus. This vitamin is critical to the membranes of the ear. Some beneficial sources of precursor vitamin A include orange-yellow fruits and vegetables, blueberries, green leafy vegetables, and oily fish. If you opt for vitamin A supplementation, you may consider taking 5,000 to 10,000 IU per day, although this isn’t the best solution. Consuming choline in a form of two lecithin capsules during each meal or taking two tablespoons of brewer’s yeast every day has been known to clear up ringing of the ears within two weeks for some patients who also have high blood pressure. According to a double-blinded study, using Ginkgo Biloba extract can help ease ringing of the ears. Those who receive the most benefit from this supplement are ones with a recent onset of tinnitus. The reason ginkgo works so well is because it increases the blood flow to the periphery (the edge of the brain and head.) This supplement is more apt to work if circulatory problems are the cause of your tinnitus. This technique is widely used to relieve congestion in the tube behind the eardrum, causing the fluid to drain away from the ear. If your tinnitus is caused by congestion of your nose, throat, or ear, this technique may be the best option. You can try this technique yourself but having a naturopath do it for you may be best.